It is perfectly normal to have teeth that aren’t in perfectly alignment with one another. It is equally as normal to have teeth that don’t meet perfectly together when you close your mouth. Whether you have misalignment or bite problems, they could be causing you to experience a variety of undesirable effects. Teeth that are twisted, crooked or overlapping, or that have small gaps between them, are more likely to develop decay since it is much harder to clean them. Meanwhile, bite problems can lead to issues such as uneven wear on the teeth, jaw and ear pain and even headaches. While there are a few different solutions for teeth misalignment and bite problems currently available, Invisalign is considered by most professionals and patients to offer the most benefits as well as being extremely successful when used properly. Here are some of the most common ways in which Invisalign is superior to alternative orthodontic treatments. Invisalign aligners are designed specifically for your teeth and will slot over the top of them, encasing them inside entirely. While the sensation may be a little strange at first, most patients get used to it very quickly. It is also much nicer than having metalwork that could cut or cause strain on your teeth, particularly after each orthodontic brace adjustment. Speaking of adjustments, a conventional brace will require you to attend appointments with our dentist fairly frequently – as often as every 3 weeks. However, since with Invisalign you can just move on to the next aligner in the series, your trips to the dentist will be less often – likely to be check-ups every 6 or so weeks throughout the treatment. Unsurprisingly, negotiating a toothbrush and floss around the brackets and wires used in conventional dentures is difficult at best, even with a small-headed brush. Studies have shown that patients who wear braces are more likely to suffer from dental caries and periodontal disease, simply because of how hard it is to clean their teeth properly. However, Invisalign aligners can be removed to clean both the aligner itself and your teeth underneath as you would normally, leading to simpler brushing and better oral health. If there is one thing that frustrates wearers of traditional orthodontic braces, it is the limitations that their device places on what they can eat. It is very easy for certain types of food to get caught up in the brackets and wires, particularly those items which are sticky or chewy. Food that breaks up into sticky particles, like popcorn, can make teeth impossible to clean while anything particularly tough to eat could even cause your braces to break. Fortunately, since you can remove Invisalign for very short periods, such as when eating, you can enjoy whatever food you like without compromise, so long as you clean your teeth and pop your aligners back in immediately after. One huge difference between Invisalign and other orthodontic treatments is that, using the technology behind the Invisalign aligners, it is possible for our provider to give you a fairly accurate idea of how your teeth will look at the end of your treatment. This cutting-edge technology delivers predictable results, and this helps encourage patients to choose Invisalign over alternatives. 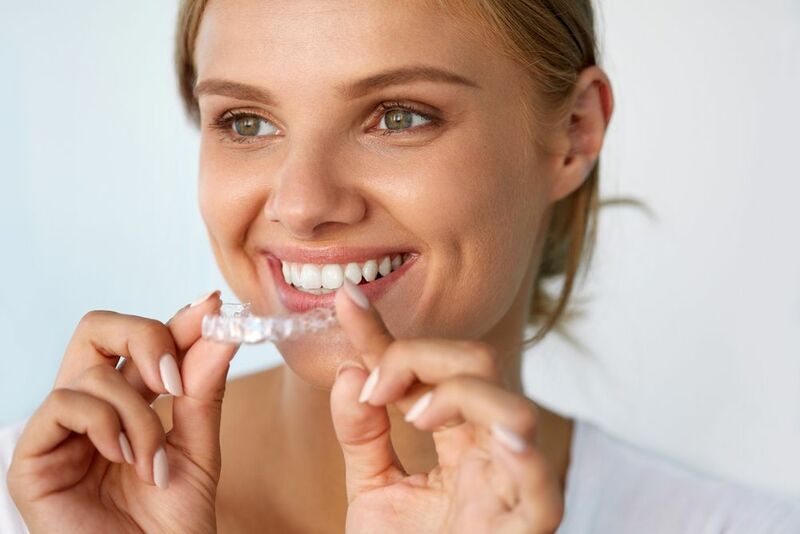 If you are suffering from misalignment or bite problems and would like to learn more about Invisalign and how it can transform your smile, please contact our offices to schedule a confidential consultation.